My eerste scoot was aangeskaf om petrol te spaar en die London verkeer n ding of twee te wys. My eerste 50 cc in 1972 het presies so gelyk. Al verskil was dat die barrel gedeelte metaalkleurig was op die fifty en swart soos op die foto as jy die 72cc omskakeling gedoen het. Ek het dit in gr 11 gedoen en vir so twee weke die vinnigste fifty in PE gehad maar toe gaan die clutch en tweede rat sommer so saam Waar kry jy die mooie vandaan? Remember the Kawasaki AR 80. That thing could shift! I also heard of okes boring out the RZ 50's and sticking in a KX 60 piston. So vyf jaar geneem om op te bou. Mine was a Puch, same as the one in the picture (the bike, not the girl). In my memory it was such a cool bike. I suppose it was because I could suddenly go anywhere. Not very fast mind you, they were restricted to 40 km/h. Ek het presies so 'n fietsie as my eerste fietsie gekry as 'n 3 jarige snotkop..
My dad on my very first bike - a Yamaha YB100. Must have been around '75? That looks like a Ford Cortina lurking in the background. First one was a Suzuki TS50ER. Replaced by a Honda MBX50 after the Suzi spontaneously disintegrated after some airtime. The worlds most expensive XT350, R62K never got to ride it. Had an AR50, but unfortunately no photos. Got an 80cc conversion, bored that out to fit a KX80 piston, ported it to the max, reamed the read block out to take a KX80 reed valve, fitted a KX125 carb, had a special pipe built and tuned it to run on methanol. I won’t mention here how fast it was. Nobody will believe it anyways, but those who want to know can ask Moereloos. He knew the bike well. 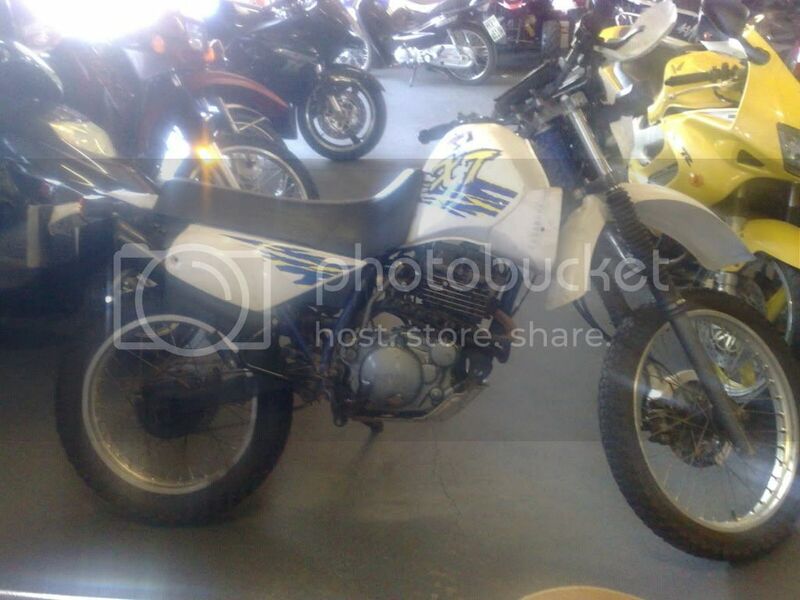 My first bike, 1975 Yamaha FS1e "Fizzy" in silver, already a relic in 1988 when I got it, bought it for R300. I really wanted a Honda MBX50 or a Yamaha RZ50 or even a Suzuki RG50 like all my mates.